MicroGroup is pleased to announce that we have been acquired by TE Connectivity (TE)! We would like to take this opportunity to talk about what this means for you as one of our customers. MicroGroup’s core metal tubing expertise and over forty-five (45) years of experience in the medical device space is an ideal complement to the investments TE Connectivity has made over the years to enhance its ability to serve you. In the last 2 years, TE, with the acquisitions of AdvancedCath, Creganna Medical and now MicroGroup, has strengthened its capabilities to be your partner of choice in the design and manufacture of Medical devices. Global Scale – We are particularly excited by the additional global reach TE’s existing medical business and its vast geographic footprint can mean to you. We can leverage TE’s medical operations across the Americas, Europe and Asia including locations in low cost countries. Broader Set of Capabilities – The combined businesses broadens MicroGroup precision metal tube and shaft offering for Interventional devices and significantly enhances our capabilities to develop and manufacture components and sub-assemblies for devices used in Electrosurgery, Endoscopy, and Analytical & Diagnostic instrumentation. MicroGroup’s capabilities complement TE’s expertise in catheter technologies, guidewires, custom connectors, cable assemblies, sensors and heat shrink tubing. Together we are positioned to deliver the most advanced, vertically integrated solutions. Engineering Resources – TE and MicroGroup place tremendous value on a high level of engineering engagement with customers. The combined business will have approximately 375 engineers working to meet your most demanding applications and challenges. Both businesses are committed to maintaining continuity for our customers. Your current points of contact will not change and our Medway location will continue to produce your product as we have historically. Our focus on superior quality and service continues. There is a strong cultural fit between both companies with a focus on customers, outstanding quality, depth of technical resources and continuous innovation. We are eager to help you realize the benefits of this combination as we look forward to an exciting future with you. MicroGroup’s Newly Configured Passivation Tank Treats Tubing Over 5 Feet! 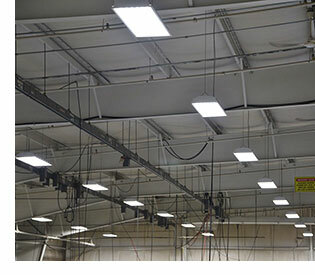 MicroGroup Goes Green with the Installation of 2,000 LED Lights and New Energy Efficient HVAC System!